Morton’s Neuroma can be successfully treated with LLLT to achieve resolution. has a special interest in providing a drug-free safe, effective treatment solution in Melbourne for acute injuries and chronic pain using low level laser light therapy (laser therapeutics). Morton’s neuroma is a painful condition affecting the ball of your foot. 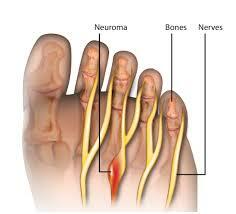 It involves inflammation and thickening of the sheath around the nerve leading to the 3rd or 4th toe. Despite its name, Morton’s Neuroma is not actually a tumour. 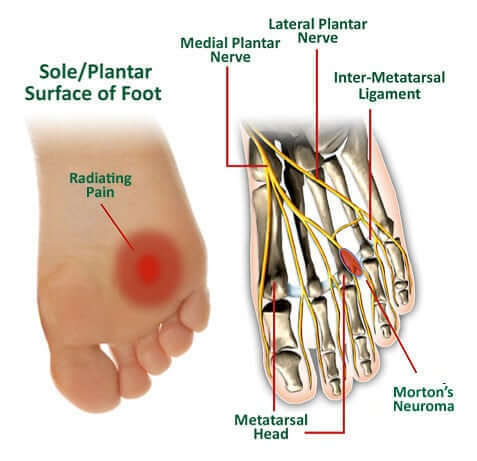 Morton’s neuroma causes any of the following sensations: a sharp, burning pain with stinging, tingling and numbness in the ball of the foot and sometimes in the toes. There may be a feeling of standing on a pebble or on fold in your sock. Symptoms are worse the higher the heel or the narrower the shoe. Anything that causes pressure in the ball or toes of the foot, or injury to this area can lead to damage to the local nerve sheath. Examples are narrow or compressive footwear, high-heeled shoes, repetitive high impact sport e.g. jogging, and also altered foot shapes e.g. bunions, hammer toes, flat or high-arched feet. Palpation of (applying pressure to) the area causes pain and sometimes a swelling is felt. Ultrasound can demonstrate soft tissue abnormalities including a neuroma and possible related problems such as bursitis between the foot bones. X-ray may be used to exclude bony causes of pain such as a tress fracture. What is the treatment for Morton’s Neuroma? Corticosteroid (cortisone) injections are sometimes used to assist in the treatment of Morton’s Neuroma. These can be painful and the procedure carries risks such as increase in pain (“steroid flare”), skin discolouration at the injection site, nerve damage, infection, tendon weakening to name a few. It is not possible to heal damaged soft tissues through strengthening exercises. The injured tendon needs to heal before it and its supporting structures can be strengthened. Anti-inflammatory medications do not heal tissues and simply act by masking pain. Use even beyond a week is associated with a number of systemic side-effects and evidence indicates these medications in fact can delay tissue healing. Rarely, surgery may be required to relieve the pressure on the nerve by cutting nearby structures, such as the ligament that binds together some of the bones in the front of the foot. Surgical removal of the neuroma may be necessary if other treatments fail to provide pain relief but, while relieving pain, the procedure can result in permanent numbness in the affected toes. Low Level Laser Therapy (LLLT) now termed Photobiomodulation Therapy (PBMT) is the application of red and near infrared light over injuries to stimulate cellular repair. LLLT has a powerful anti-inflammatory effect as well as a healing effect on the inflamed nerve and its sheath in Morton’s neuroma and surrounding inflamed soft tissues. LLLT is completely safe and has no effect on normal tissues. LLLT treats the underlying cause of the injury unlike pain medication which just masks the pain. Read in detail here how LLLT can resolve Morton’s Neuroma, effectively and affordably.